It was on a Sunday, in January, a few years ago, Feast of Santo Niño – The Child Jesus -, at the Ina ng Laging Saklolo Chapel, in Sitio Militar, Q.C. 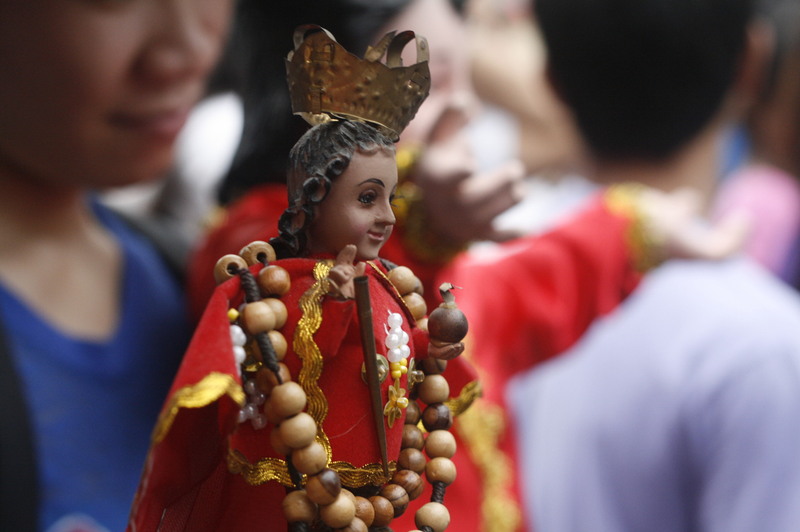 Santo Niño is one of the most popular and loved devotion in the Philippines. Many Overseas Filipino Workers, in fact, bring this and others devotions wherever they go. The Santo Niño is a favorite object of affection for many Filipinos and they adorn him like a child with clothes and gifts. Some put on his image garments or costumes according to their own need or in accordance to their own profession or state of life: a poor boy, a farmer, a basketball player, a businessman and so on. 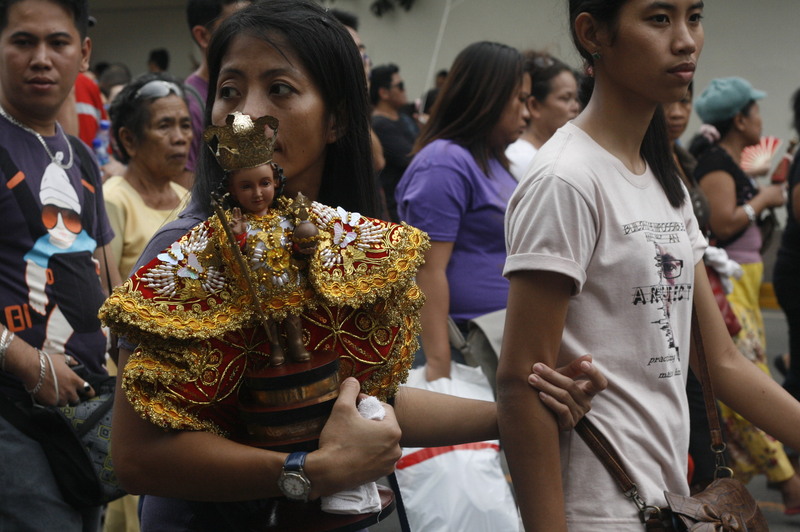 Hence the Santo Niño is one of the features of the humble Christ which the majority of Filipino feel identified with. On the other hand, I have come to realize, by studies and by concrete experience, that Filipino people have inherited from their ancestors a rich spirituality. It is a product of a long history as a people, starting long before the Spanish missionaries arrived in this country. As the Filipino Bishops would say: “Our native spirit and the foreign religious way of life co-exist now in our consciousness as Christian faithful…In fact our spirituality is not comparable to that of other Christians in Asia, because, unlike them, we are a vast majority in our country… Our Christian faith is like a plant from a foreign land that grew in our own soil as a huge tree. The roots have penetrated deeply in our native soil, and in the soil of our souls. The fruit has grown and borne fruit…” (CBCP, Filipino way to Holiness, 12, July 1999) so that it can be affirmed that, although Christianity was not originally native to the Filipino, it is foreign no longer. Yet, here are the two women, with their Santo Niño, going back to Japan to work as entertainers or/and P.R.O. I have to say that their faith (which I don’t want to judge) in Santo Niño expresses very well the “weak”, “limited”, “oppressive”, “humble”, “poor-mentality” aspect that easily makes Filipino people accept suffering and injustice as a kind of kapalaran (fate, destiny) written in the palm of their hands. Filipinos never lack reasons for sufferings. Aside from several natural calamities, they are affected also by the suffering they experience from the political, social and economic system that continues to cause the dehumanizing poverty of the majority of the people. “Pagsubok lang father” meaning: it’s just a trial Father! It is God’s testing them daw. And Santo Niño is playing a formidable role in making them resilient or patient in suffering, and –eventually- to come out as winners! Although the Gospels prove that poverty and destitution are not separate from our search for the richness of the Kingdom of God, Jesus’ message doesn’t agree with the idea of embracing suffering for its own sake. Perhaps Filipinos need to have this Good News announced more meaningfully and more often. “Amen, I say to you, whoever does not accept the Kingdom of God like a child will not enter it…. Then he embraced the children and blessed them, placing his hands on them” (Mark 10:13-16). Being embraced like a child is so comforting that it is easy enough to be childlike and entrust ourselves in Jesus’ care. And I come to understand that, just as a shepherd takes the ewe in his arms, eventually it is Santo Niño who holds and embraces these two women close and bless them. That must be their way of experiencing a loving and caring God who gives them back the dignity, the honor, as truly children of His. That’s why they will take Santo Niño, their charming little prince, with them to Japan. More than enough to face whatever life will bring about. Pit Senyor! Viva Santo Niño! Happy feast of Santo Niño to everybody! I am a Cebuano. I was born during the feast of the Sinulog! Pit Senyor! Viva Sto. Nino. Popular religiosity and piety and devotions made the Church of the Phillipines continue to exist and to grow for almost 500 centuries already. this is inculturation of the Gospel of Christ in Phillippine soil.